Your wedding should be the most wonderful day of your life. It’s the moment when you declare your lifelong love in front of your friends and family and a day that you will never want to forget. That’s why it is so important to make sure that you get all of your planning right to create a beautiful and unique event. We have seen more and more brides moving away from the idea of a traditional wedding. Instead they have been choosing to really embrace their individuality when planning their big day with unique touches to make it personal and memorable. So here are some of our ideas for how you can make your day truly individual. At Wedding Letter Hire we can provide any set of initials or any name in our 5ft high illuminated letters for hire – so you really can see your name in lights! Other popular options include ‘LOVE‘ and our light up Mr and Mrs sign. Our customers love the fact that our letters can add a really personal touch to their day. Some of our creative brides and grooms have even based their whole wedding around their initials designing personalised invitations with a monogram of their initials on, and making sure the letters are a key feature of their photos. Others have told us that they have swapped traditional decoration such as flowers or balloons for our light up letters as they wanted something really different, and thought that our giant letters would have a much greater impact and would really stand out from the crowd. There’s never been a better time to make your event as unique as possible. With venues available from historical homes to art galleries and museums to football stadiums you really can let your personality shine through on this unforgettable day. Take your time to look around your venues and pick one that really suits your interests and character. 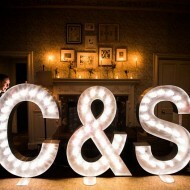 We’ve provided light up letters for stately homes, garden marquees and even at a festival themed outdoor wedding! It’s been amazing to see how each of these settings has their very own individual style and feel. We love the fact that our letters also work well at any venue and look brilliant with every theme. It’s often the little finishing touches to a fabulous day that people remember and these small things can be really individual. Many brides love to use names instead of numbers for tables at their wedding breakfast and often these relate to the couple’s interests and hobbies. We’ve seen people call their tables after romantic city breaks they have been on, football players from the team that they support or the titles of their favourite films. Favours have also moved on from the ubiquitous sugared almonds. Now people are using these little thank you gifts as a way to express themselves. Why not include little pots of homemade jam at a country barn setting or hand painted stones from the beach for a wedding by the sea. Some couples have even used our letter light initials for inspiration and had their own miniature bottles of champagne made with their entwined initials printed on them! There are many places that you can get some fabulous ideas and inspiration for your planning. We love Pinterest and you can take a look at our boards for some great wedding themes. Why not follow us on Facebook and Twitter too and keep up to date with the latest trends, news and gossip!